Add this shop to my favorites. The Isles of Azores - Morden (1693). Availability: in stock Condition : Good, some staining. English text on verso, please study image carefully. Date : 1693 Overall size : 15 x 19 cm. Image size : 13 x 11 cm. 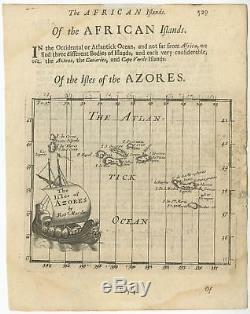 Description: Antique Map Azore Islands titled'The Isles of Azores'. Rare map of the Azore Islands. Originates from'Atlas Terestris' by R. Artists and Engravers: Robert Morden c.
1650 1703 was an English bookseller, publisher, and maker of maps and globes. He was among the first successful commercial map makers. The item "The Isles of Azores Morden (1693)" is in sale since Friday, November 2, 2018. This item is in the category "Antiques\Maps, Atlases & Globes\Africa Maps". The seller is "bartele-gallery" and is located in Langweer.